The tent stuff sack comes ready to hook to your bike. New for Spring 2019, Big Agnes launches a series of tents designed for the ultralight bikepacker. Whether heading out on a solo adventure or with your favorite riding buddy, the four different tents are lightweight, pack down small, and even come ready to hook on your handlebars. For the bikepacking collection, Big Agnes took their most popular ultralight backpacking tents and made them more bike-friendly. Both The Copper Spur HV UL Bikepack and Fly Creek HV UL Bikepack use a new poleset that breaks down into 12- to 13-inch sections, ideal for storing on your handlebars or inside panniers and saddlebags. For example, instead of a packed size of 4″ x 19.5″ for the current Copper Spur HV UL2, the Bikepack version packs down to 6″ x 12″. The new pole design shaves a few ounces off the packed weight of the Copper Spur tents (adds a few ounces to the Fly Creek versions) but doesn’t impact livability — all tents feature the same floorspace, internal height, and vestibule space (even if shorter) of the ultralight originals. 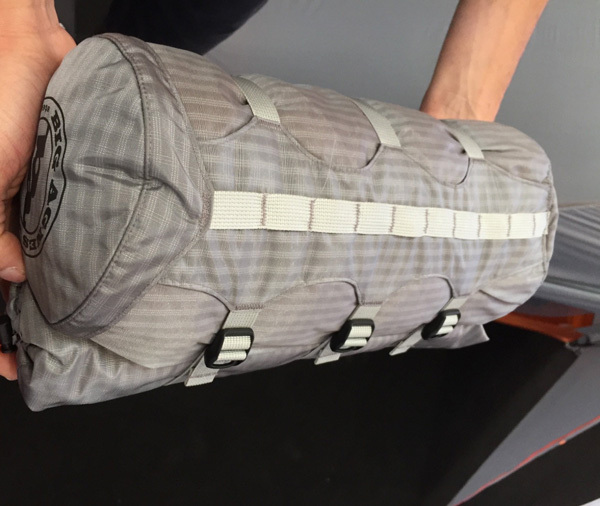 The compression stuff sack for the bikepack tents comes with a daisy chain webbing system that can be used for multiple bike attachment configurations. Color coded webbing and buckles make setup go much quicker when you’ve stopped for the night. Other bikepacking specific updates include elastic webbing to securely store your helmet on top of the tent body, along with oversized ceiling pockets for further storage space. Daisy chain webbing loops on the fly’s exterior enable you to dry your wet clothes and gear in the sun. The larger footprint (sold separately) for each bikepack tent is extended to create a dry vestibule floor for changing and storing gear off the wet ground. The larger footprints mean a few added ounces of weight. Both the Big Agnes Copper Spur HV UL Bikepack and Fly Creek HV UL Bikepack tents come in one person and two person versions. The bikepacking tents will start shipping next spring.